Lift chairs are beneficial if you have difficulty rising form a sitting position and getting out of a chair. Comfortable and attractive, these chairs look similar to regular recliners, except they feature a remote and motorized mechanism that gently pushes you up to a standing position. There are three types of lift-chair models: two position, three position, and infinite position. All three choices enable users to stand and sit without assistance. Though, pricing correlates to the number of options and features a chair provides. Two-position chairs have a lift position and enable a slightly reclined position. They cost less than other models and are appropriate for reading and watching television. However, you cannot sleep on a two-position chair because it does not fully recline. If you do not plan on using the chair for napping purposes, a two-position chair is likely sufficient. A three-position chair is more versatile and can be adjusted to a fully reclined position in addition to other positions. Infinite-position chairs are the most expensive of all lift chair models. They can be adjusted to nearly any position and are thought to be the most comfortable choice in the category. Infinite chairs feature a dual motor to support both the back and the legs. They enable users to position their feet above their hearts, which is helpful for some medical conditions. The height and weight of the individual are important to consider during the purchase process. 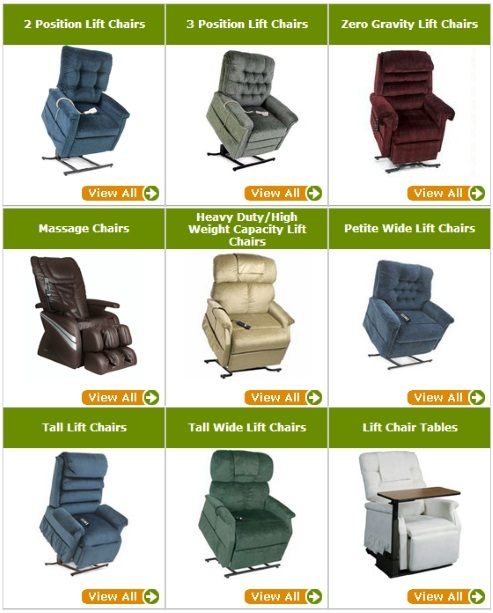 Chair sizes range from petite to heavy duty. Some heavy duty models can accommodate people over six feet tall who weigh up to six hundred pounds. It's important to choose the correct size because the chair can malfunction quickly if it is not equipped to accommodate your size and weight. Other factors during the selection process include the location of controls and extra features such as built-in heating, massage, cup holders, pockets for magazines, and snack trays. Styles, colors and fabrics vary, enabling you to easily coordinate your chair with your home décor. To read more buying tips and purchase considerations, please click here.